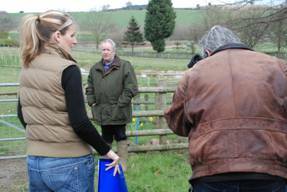 Peter Kidman and Stuart Little undertook a whistle-stop tour of three counties when they filmed interviews with three farmers in Shropshire (above right), Worcestershire (above left) and Gloucestershire at the end of March. 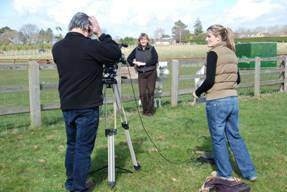 The interviews each took place at the farmers' own farms and are featured in training sessions for Rural Payments Agency staff. In October 2007 we recorded some live facial rejuvenation sessions in central London for Allergan. These took place in front of a live audience but for convenience the close-up video images of the subjects' faces were projected onto a large screen within the 'operating room' (actually a conference room) whilst the plastic surgeon gave a running commentary to the audience. In February KLA spent a very pleasant Saturday evening at the Bakko Restaurant in Muswell Hill filming a) in the kitchens b) 31 individual dishes and c) a belly dancer in the main restaurant. The purpose of this was to create a short video to run in continuous loop mode on a screen in the restaurant's front window. Following on from a series of training sessions delivered by KLA's sister company Swanrose Video training and Consultancy to staff at its Canary Wharf venue in June/July 2007 Clifford Chance LLP asked KLA to take on certain categories of its video facilities requirements. Happily this arrangement has worked out very well and KLA continues to provide a video facilities service to Clifford Chance LLP on a regular basis. In mid March Stuart and Oliver found themselves on Salisbury Plain on a cold damp Friday evening once more filming fireworks for Stealth Fireworks. KLA is now working on the editing and DVD authoring for Stealth Firework's latest DVD catalogue. Meanwhile KLA is in the process of transferring around 8000 feet of cine film to DVD for a regular facilities client. Another regular client - the Chi Kung College - has asked KLA to produce some further promotional DVDs. Work on a Juan Martin promotional DVD for yet another regular client - FlamencoVision – is still to be scheduled but will hopefully start soon. Meanwhile we will shortly be doing some filming in Selfridges for client 3Lab. Unusually KLA has made no recent major purchases but is considering the acquisition of a new large flat screen TV to go in its 'reception' area. The release date for this Newsletter coincides with the launch of our refurbished web site. The web site has been comprehensively re-designed by Swanrose colleague David Brindley and new features include video samples (in Flash format), a PayPal facility for purchasers of our Alexandra Palace documentary and a much-simplified and more intuitive user interface.